The 9950 Dual Channel Transmitter is a two channel controller that supports two sensors of same or different types in one instrument. 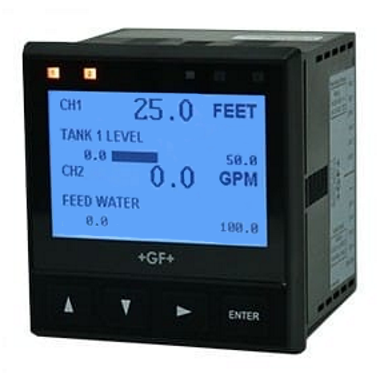 ​The sensor types supported by the 9950 are Signet Flow, pH/ORP, Conductivity/Resistivity, Salinity, Temperature, Pressure, Level, Dissolved Oxygen, and devices that transmit a 4 to 20 mA signal with the use of the 8058 iGo® Signal Converter. The 9950 includes advanced features such as derived functions, advanced multiple relay modes, and timer based relay functions. Derived functions allows for the control of a relay or current loop with the sum, delta (difference), or ratio of two measurements, for example delta pressure and delta temperature. Multiple relay modes allow up to three signals to be used for the control of a single relay. This can be any combination of analog and binary inputs. The timer relay modes allow a relay to be activated on a repeating basis from every minute to once every 30 days. Weekday timer mode allows a relay to be energised on a specific day or days of the week at a specific time. If your organisation requires five or more 9950 units, please contact our team of experts for a quotation.